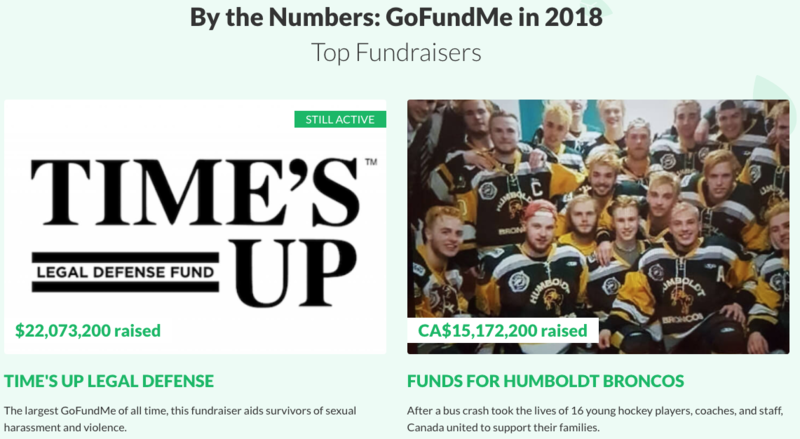 Funds For Humboldt Broncos was the most viewed GoFundMe with more than 1.9 million views within the first 24 hours. With 141,984 individual donations from more than 80 countries, it also raised the most donations to a single fundraiser in GoFundMe history. A group of Canadian citizens raised money for 16 hockey players, coaches, and staff of the Humboldt Broncos hockey team who died in a bus accident in April, totaling $15.17 million (Canadian). Another 13 were injured. The February shooting at Stoneman Douglas High School in Parkland, Fla. spurred three of the largest campaigns. More than 26,000 peopled donated $10.1 million to the Stoneman Douglas Victims’ Fund after the school shooting, and March For Our Lives, consisting of students of Stoneman Douglas High School who survived the shooting. raised $3.58 million. A GoFundMe to support the family of Anthony Borges, a survivor of the shooting, raised $910,230. Several campaigns that were among the largest are still active, including Houses For Rohingya Refugees, a group of individuals who built homes for Rohingya refugees raised $2.1 million. A campaign for victims of November’s Tree Of Life Synagogue shooting in Pittsburgh, Pa., has raised more than $1.23 million. Another million-dollar campaign was the Ari Fuld Memorial Fund, which raised $1.091 million to support the family after his fatal stabbing in the West Bank in September. Almost $30 million was raised for the victims of the California wildfires. More than three out of five people (61 percent) who gave to GoFundMe in 2018 gave for the first time. The most prolific donor gave 141 times to 132 different fundraisers, according to the report. The fastest-growing categories on GoFundMe are events, family and animals and pets.